Commercial truck crashes have devastating consequences on innocent people every day. 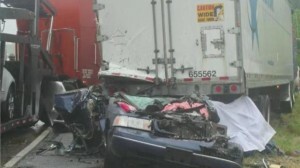 When a big rig driver is negligent and collides with a passenger vehicle, terrible injuries and even death can occur. When a truck crash occurs, the truck driver may end up paying a heavy price in criminal court; this can include a prison sentence and hefty fines. However, this outcome does nothing to compensate the injured person, or their family in a case where the loved one is killed. That is where an experienced trucking injury attorney can be extremely beneficial. In a case where it appears likely that a truck driver was negligent – whether he was engaging in reckless driving, fell asleep behind the wheel or even was intoxicated – an effective personal injury lawyer can help accident victims and families to recover substantial financial damages in civil court. Breach – There has to be a breach of this duty proven in court. Causation – Must show that the driver’s actions or inaction led to damages and injury/death. Damages – Must show that the victim was harmed by the truck driver’s actions or inaction. Surveillance camera recordings from the Department of Transportation for that state. In some accidents, there is recorded video evidence that can be used in court, such as video surveillance cameras at major intersections and under some highway overpasses. Tracking video on inward and forward mounted cameras in commercial trucks, buses and vans. This video evidence also can be used in court to prove that a commercial operator drove irresponsibly. Black box data that is fed from the trucks back to company headquarters to monitor truck driver performance. This data can include braking, speed, how many hours they have driven, and many other critical datapoints to prove negligence. Credit card receipts and vouchers submitted by the driver. Mobile phone billing information to establish if the truck driver drove more hours than he legally should, if he deviated from the work route, or if he was on the phone during the accident. It is with these types of technological tools that we have been able to successfully settle many tragic trucking accident crashes that provided the injured and their families with proper compensation for their suffering, including this $21 million structured settlement.